The aging balance is an accounting document widely used by credit manager and cash collectors. It summarizes all the accounts receivable split by age. The accounts receivable are a part of current assets and as such is only a temporarily item. A specific item (an invoice or a credit note) appearing in a customer account is not expected to remain outstanding over the period of time of payment term granted to the client. The aging balance allows to perform an analysis by customer on the amount of open receivables and its impact on cash and working capital requirement. It is structured around the due date of invoices, which allows to have a quantitative (amount outstanding) but also qualitative (age of invoices versus due dates) view of the accounts receivable. Indeed, the open receivables impact cash flow but can also generate losses because of their age, inversely proportional to the probability of recovery. One of the great interest of aging balance is to provide a view of receivables by customer and by late payment tranches based on number of days late. A first column for not yet due receivables: we are at the stage of pre-recovery actions. 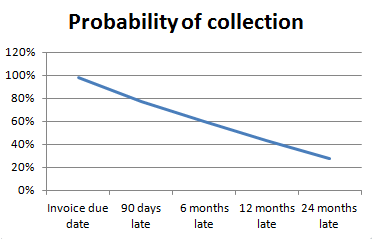 A second column for short delays of less than 30 days: collection levels 1 and 2. A third column for delays between 31 and 60 days. We are around 60 days overdue and at the end of the friendly collection process. A fourth column for delays between 61 and 120 days, which is the beginning of recovery litigation. A fifth column for delays of more than 120 days which may have causes like unresolved dispute, payment delays related to a default of the customer or an insolvency (bankruptcy proceedings). The invoices involved will certainly be provisioned into bad debts which will negatively impact the income of the company. The sixth column is the total amount of overdue. The last column is the total outstanding, for viewing clients with whom the total AR outstanding is most important. The accounts manager uses the aging balance to measure the quality of its overall accounts receivable and per customer. All his actions are done to prevent receivables are moving to right columns in order to preserve cash and profitability of his business. How to drive its recovery with aging balance? The advantage of this tool is that it allows you to target the largest amounts overdue and the amounts that are due for the longest time. The first is based on decreasing outstanding amounts to perform preventive reminders on at least largest amounts with the aim to get a promise to pay for the due date. The second is based on the total amount overdue. A descending sort is performed on this column to highlight the biggest customers overdue. The cash collector chases up the biggest amount then the next ... etc. The third focuses on the oldest delays (eg more than 120 days) due to their criticality. The more time passes, lower are the chances of getting paid. A descending sort is performed on this column and the manager tackles the biggest delays longer than 120 days and then down the aging balance. The disadvantage of this method is that even if it is based on three inputs (not yet due, total overdue and oldest invoices), the manager tends to work on the front lines (the largest overdues), and not to go at the end of the aging balance (to the last amount). The risk is that some customers are not chased up while it is key for the company to get paid all his bills, whatever is the amount. We must therefore ensure that this prioritization does not lead to forget some non-priority customers and that all of them will be chased up. 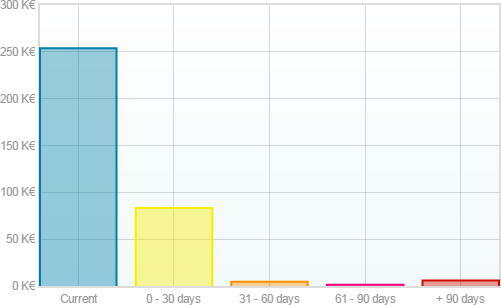 Ageing balance is a central tool in MY DSO MANAGER for organizing its debt collection and assess its performance. It covers all company's receivables or is split by customer groups (configurable) or per customer. See more. The aging balance is a management tool but also a performance assessment tool in cash collection. Indeed, it allows to highlight the % of overdue and to split it per tranche of delay. This is providing a much more detailed analysis. Indeed, a high rate of overdue is a lesser evil if the receivables are past due for a short time. However, if the rate is correct (below 10% for example) but invoices are overdue for a long time (several months) the situation is much more serious. The rate should be lower and lower gradually as the column corresponds to the oldest debts. In above example, the overall overdue rate is 27%, which is high. We also see a significant problem with the client Trelevern Ltd, which has a lot of bills late (50% for 8617 euros) including old debts (14% which are more than 120 days late). This is a customer who does not pay for several months. Urgent action needed! An explanation: Why this invoice is not paid? An action pending or future: What is he doing to solve the problem and bring the customer to pay? The aging balance is also a warning tool to manage customer risk. Indeed, a customer account with unpaid debts can be caused by financial problems, which should lead to a blockage of orders and deliveries. Is a bill late on the day of its due date or the next day? The customer agrees to pay the bill on the day of its due date, that is to say that the payment should arrive on the seller's bank account on that date. The reconciliation between the payment and the invoice can be done immediately and the bill cleared. Therefore, an unpaid invoice on the due date is a delay in payment on invoice. The aging balance is a central tool for the persons involved in the management of trading receivables and debt collection. It allows both to organize and prioritize actions for collection and to monitor performance. It is also useful to determine the amount of bad debts provisions which are partially resulting of the age of the receivables. What is the result of 9 5 ? Hi, could you please let me know what is the right date to use for creating an aging balance in column "Not due"? The invoice date or due date? Thanks, Mike. Hello Mike, the aging balance is set according to the due date of transactions only. I would like to thank you for these very important source of financial analysis.